Princess Beauty lived in a castle in the southwestern desert with her parents. She had almost everything a girl of her age could want, except for the one thing she wanted above all else. She wanted a pair of soft, pale pink wool socks and mittens to match. Now you might ask why a princess couldn’t have her every desire. Well it’s this way! Like all girls her age at the time she had chores that must be done. She might only be 12, but she was in charge of the Spinnery and the Weavery at the castle. She had been charged when she was 9 to make sure that every person in the kingdom got enough wool or yarn to make a new pair of socks and mittens every year. She discovered on the first year that everyone wanted the nice soft Debouillet and Rambouillet wool for their socks and mittens. The whitest and finest of wools went to the spinners first. Then everyone else in the castle could choose their wools after that. Even the lowest scullery maid had a choice before Beauty was allowed to choose her wool. Always there was only the very coarse Churro wool left. And it was always a muddy gray color and couldn’t be dyed to a nice pink at all. Oh, yes, it never wore out, but what was the point in that? Beauty dashed up the stairs to the attics, there was dust everywhere above the fourth floor. No one had swept or dusted in years. Spider webs were everywhere. They covered the windows, they connected the equipment to the old chairs and other furniture. Beauty was amazed at the walking wheels. They were beautifully made pieces of walnut and mahogany. The wheels themselves were higher than her head. And there were bags of wool just laying there under each wheel. Beauty barely slept that night. She was so excited, but knew she couldn’t go to the attics until she had completed all her chores downstairs in the Weavery the next day. Fabric for the new cloaks and shawls was being made and she had to make sure all the looms were up and working before she could do anything else. If someone were ill, she would have to fill in for them. 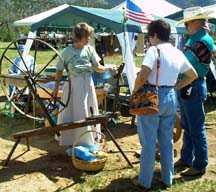 As spinning was finished for the time being she wouldn’t have to do more than make sure the Spinnery was clean and all spindles and baskets were stored properly. to weave. I, too think it will be a long cold winter, and early as well.” Beauty took off in a very unprincess like manner. She was in luck, every weaver was in place and ready to work. Of course, all weavers know that a little cold won’t keep them from dancing the treadles as this is hardly work. The only thing that will keep a weaver from her job is a broken arm or leg. Beauty loved to weave and did at every chance she got, but today she wanted to be in the attics spinning. She was so looking forward to her soft, pale rose pink socks and mittens. And there was even enough wool up there that she could have a cap to match. The weavers didn’t need minding, so Princess Beauty was able to be out of there in a flash. She missed morning tea, she missed lunch, she missed afternoon tea, she missed . . .! She was getting tired and bent over to her basket to get the last piece of roving and raked her arm on the tip of the spindle. She fell asleep instantaneously. Just as the wicked fairy had predicted twelve years ago, she had pricked herself with a sharp pointed object. Now at the same time as the wicked fairy had put the curse of the pricking on Beauty, she had also condemned all the handsome princes in the world to live as ugly green frogs. They all knew the tale, but none knew who was the real Prince Handsome and who was just an ugly green frog. But, being told from birth that one of them would turn into Prince Handsome upon kissing a beautiful princess, they were all looking forward to finding one. The tale of the poor Princess Beauty asleep went out all over the kingdom and spread around the world. Every ugly green frog had to make the trip to the Fair Kingdom to try kissing the beautiful sleeping princess. Do you know how many ugly green frogs kissed that beautiful sleeping princess over the next 100 years? Well, now it really doesn’t matter at all does it! Finally the one who was the Prince Handsome kissed the sleeping princess. She awoke immediately and he turned into the Prince. Wow!! Did she say, “Oh, my! What a handsome prince you are!”? Oh, no! Not our dedicated Princess Beauty. She said, “Oh, Dear! Cook will have tossed out all the cactus apples she promised me so I could dye my white yarns a nice soft pink!” and down the staircases she ran. She ran into the kitchens, Everyone was different. Not a soul she knew! Clothing styles were different! No one was even wearing socks, let alone wool socks!